Traveloscopy Travelblog: Struth! On the nose. Australia's biggest truffle. Struth! On the nose. Australia's biggest truffle. TED Smith with his record-breaking 1.172kg NSW Southern Highlands truffle. 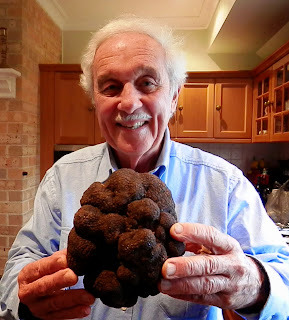 And Ted and Barbara Smith who own Yelverton Truffles at Robertson 2hrs south of Sydney, didn't even need their truffle-sniffing dog to find this one, because it had forced itself up through the ground amid their 300-plus truffle-inoculated oak trees. And when their own scales gave up weighing it at 1kg, they had to take it to the local Post Office to get the exact weight there. The Smith's got calls from chefs around Australia and even Asia keen to buy their outsize "underground treasure," that unlike most truffles that grow to between golf- and cricket-ball size, was more soccer-ball-ish. But it's not gone to an eatery outside the Southern Highlands: Bowral's Centennial Vineyards Restaurant bought it to use in specialties that'll be on the menu during July, including truffle and scrambled eggs, truffle omelettes and truffle and pasta. And while no-one's saying how much was paid for this French Black Perigord whopper, truffles can fetch $2,000 a kilogram in this country, suggesting this one would have been worth around $2,350. Yelverton Truffles have regular Truffle Hunts during the May to August harvesting season, including a PowerPoint lecture, a truffle-dog sniffing-out hunt, and truffle tasting. Details info@yelvertontruffles.com.au or (02) 4885 1924. FOOTNOTE: The world's biggest-ever truffle was unearthed in Croatia in 1999 and weighed 1.31kgs.